Finals. Are. OVER! Welcome to Part III! Again, my apologies for the delay. The end of classes and finals week is always a hectic time. Coupled with a move to Seattle and the start of a new (well, return to an old) job I had to put Boisetopia on the backburner for a little while. I’m happy to report that I’m back! Here’s the skinny: Fueled by the increase of business traffic resulting from the completion of 8th and Main and the soon-to-be-under-construction Simplot Headquarters, it stands to reason that a new hotel is on the way just from that alone. Coupled with the conversion of the Owyhee Place Hotel into apartments and the potentially upcoming City Center Plaza, the demand for hotel space in the future could seriously spike. Recently, Boise’s Design Review Committee approved the $70 million City Centre Plaza. It’s yet another big hurdle for the Gardner Company cleared. I’m getting increasingly confident this project will happen. This development would change the market dynamics of a new hotel–the expansion assuredly increasing demand for hotel space as Boise becomes competitive for 70% of the convention market, as opposed to the current 35-40%. In Part II, I estimated about 350-400 new hotel rooms would be a reasonable quantity to expect in the near future. For now it’s up to developers. From everything I’ve gathered in my research 350-400 seems like a solid middle-ground number. But a big question remains: Where could new hotels go? The next parcel I’d like to example is the infamous “Parcel B.” Infamous because despite being one of the most visible, prominent pieces of land downtown, it’s served virtually no purpose, being nothing but an ugly dirt lot, for decades. Now that the longstanding plans for a new convention center on this parcel have been formally scrapped, this lot will likely be sold to developers in the near future. The greatest advantage this location offers is space and visibility–the parcel is seen by thousands of cars everyday entering and exiting Interstate I-184 (the connector), and any development would be highly prominent in the skyline. For a hotel, there’s ample wiggle room to spread out, so building vertically isn’t a necessity. Its location at the foot of the connector gives easy accessibility to I-84 and the rest of the Treasure Valley. 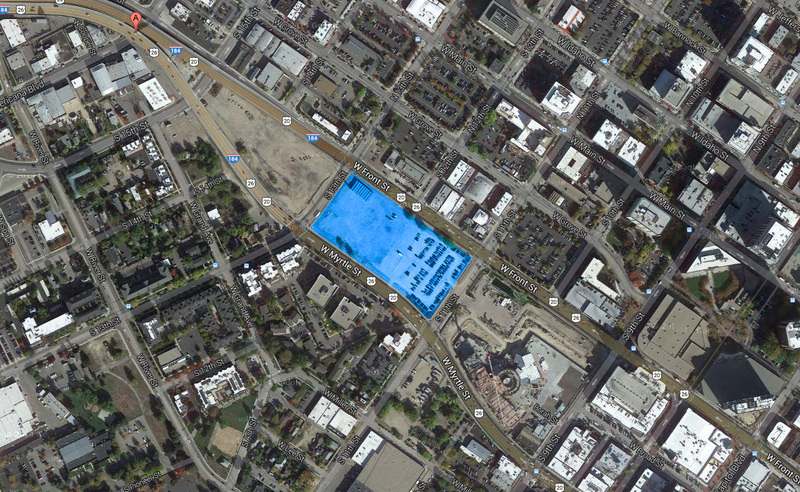 A large new hotel here would arguably be the most visible building in Boise, depending on height and massing. It’s one of the noisiest parcels in Downtown, thanks to the connector traffic flowing into these two streets creating some of the heaviest and fastest moving traffic in the area. The sound of trucks moving, motorcycles accelerating, and car horns blaring during rush-hour commutes as traffic exits the connector does not make for a hospitable environment. Second, between the speed of traffic, the noise, and the sheer width of these streets, the parcel is one of the least pedestrian-friendly areas of downtown. It’s why I never bought the idea that this was a good spot for a Convention Center: When guests are done convention-ing and they want to explore the city, where do they go? Front and Myrtle practically strands them on an island of traffic. It’s why I’d like to see 12th Street punch through and divide this lot in half. Even better would be to see 12th Street continue south, with a slight westward curve to connect to S. 12th St. Not only would all of this mitigate many of the problems list above, it would also restore the connection between West Downtown and the River St. neighborhood, which I imagine would raise property values and encourage development along the Pioneer Corridor. I don’t know if it’d solve the problem completely, but I imagine it’d help. Food for thought. If these disadvantages could be overcome, this may be the best place for a really large hotel (around 500-700 rooms) if a developer wanted to go all-in on this parcel like what’s currently happening in Spokane. Having a hotel of this size would be a boon to attracting major events to Boise. I crafted a few renderings to show what a roughly 700 room, 7-12-floor, two-tower hotel with retail and parking components in this parcel might look like. A skybridge could connect the two if necessary. I’m not sure how keen I am on this next idea, but I thought it was worth showing. Another thing that could be done on this space is a large hotel with a 10-15,000-seat multipurpose arena attached to it, theoretically replacing CenturyLink Arena and becoming the new home for the Idaho Steelheads, and Idaho Stampede. It could also theoretically replace the Idaho Center in Nampa, becoming the new home of Snake River Stampede, but I’m guessing the folks in Canyon County wouldn’t be too happy about that, and I’m not sure there’s any real need to move that event in the first place, other than to locate it to a venue that can hold more spectators. Another advantage to moving the arena here is that the current CenturyLink Arena could be renovated into 100% exhibition space, allowing for further expansion of the convention center beyond City Centre Plaza. A new arena could allow Boise to land the NCAA Tournament again, as well as other major spectator events with a state-of-the-art design. Perhaps a deal could be worked with Boise State to house some of the men’s and women’s basketball games here. But then maybe not. It’d be ambitious. And I also think a local-option tax would likely be required for this venture: not only would the demand have to be there, it’d have to be approved by Boise voters. Maybe it’s just easier to build a big hotel and that’s it. But then, I do love to dream big. I will continue this with Part IV, and I absolutely promise it will come sooner than Part III did to Part II. As you’d probably know from me already, I strongly agree with extending 12th St as you described. The formidable Front/Myrtle couplet needs as many safe access points as possible for non-vehicle traffic, as well as access points for light levels of vehicle traffic. Extend 12th, put traffic signals at both Front & Myrtle and time them with the one-way synchronization already in place. And while we’re at it, do the same for 4th Street as well. Don’t allow more superblocks that we have allowed for the courthouse area (this one is really the worst), as well as JUMP, though there may be at least a little wiggle room there. Great post. I love seeing all the renderings you do to give an idea on how Boise could look with new developments. I like the location on Part 2 for a hotel. Interested to see what becomes of Parcel B though. Hi admin !! I read your posts everyday and i must say you have high quality posts here.